1895- Hall of Famer and “Father of Professional Baseball” Harry Wright, bequeathed his archive of baseball pictures and documents to the National League and the Amer. Assoc of Professional Baseball Leagues. When Wright died in 1896, Hall of Famer, baseball official and sporting goods magnate Albert G. Spalding took possession of the archive. 1905-1908- Hall of Famer and “Father of Baseball” Henry Chadwick gifted his archive to Spalding as well. When Chadwick died in 1908 the remainder of the collection was given to Spalding by Chadwick’s widow. Both Archives (and Spalding’s own personal collection) served as the basis for Spalding’s published history of the game, “America’s National Game” (1911). 1911- AG Spalding publishes “America’s National Game” utilizing the donated archives of baseball’s founding fathers. The pictorial reproductions featured in the book are furnished by Spalding and his voluminous baseball photography collection. 1922- NYPL publishes a 44 page pamphlet and detailed inventory of the “Spalding Collection”. 1987- NYPL compiles a report regarding “missing items” from the original 1922 inventory of the Spalding Collection photograph archive. The collection housed the Knickerbocker Base Ball Club Score Books of the 1840’s; the by-laws and constitutions of the earliest clubs known as “Eagle“ “Excelsior” and “Knickerbocker” ; Chadwick’s personal scrapbooks and score books, including the one chronicling the famous 1858 Fashion Course Matches; Harry Wright’s incoming and outgoing correspondence scrapbooks spanning the years 1865-1894; and a treasure trove of rare photographs showing images ranging from schoolboy Al Spalding on his first Forest City amateur teams to the autographed CDV and cabinet photos of the earliest professional champion players from Boston and Philadelphia. Spalding died in 1915 and in 1921 the New York Times reported his widow’s donation of the collection to the New York Public Library. 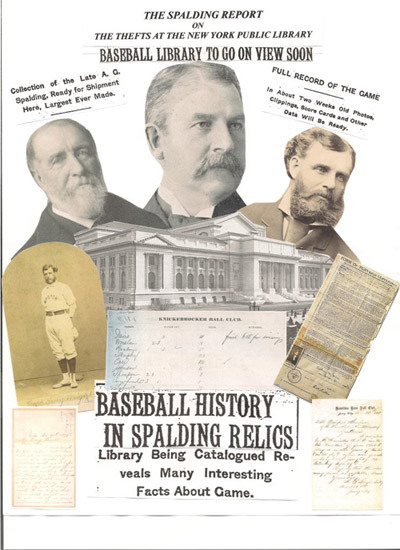 The headline copy heralded: “BASEBALL HISTORY IN SPALDING RELICS: LIBRARY BEING CATALOGUED REVEALS MANY INTERESTING FACTS ABOUT THE GAME: BEWHISKERED BABE RUTHS.” Once the collection left the security of Spalding’s west coast version of Fort Knox, the time capsule documenting baseball’s infancy became the property of the people of the City of New York. Accessible to both the scholar and the scoundrel; the baseball fan and the thief. Anyone interested in researching the national pastime was welcome to view Spalding’s library of data housed on 42nd St. and 5th Ave. along with the Gutenberg Bible and Thomas Jefferson’s hand written copy of the Declaration of Independence. In the 1970’s a significant portion of the Spalding Collection’s manuscript and photographic archives disappeared from the New York Public Library. Since that time, the rare items donated by Spalding’s widow have appeared in public auctions and on the tables of dealers at baseball card shows and conventions. Other Spalding treasures have traveled underground into the collections of individuals who are now in the possession of stolen property. 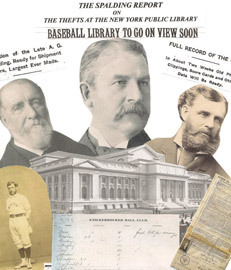 In the summer of 2009 Major League Baseball sponsored their own All- Star Game Weekend auction conducted by Hunt Auctions and it was discovered that the auction included many pieces of correspondence to baseball pioneer Harry Wright that were, in fact, stolen from the New York Public Library’s Spalding Collection. In response the FBI launched an investigation and took into their possession the MLB auction’s offerings of the Wright correspondence. The FBI investigation is on-going. The services of Hauls of Shame and Peter J. Nash as a consultant and expert are available to collectors, auction houses, institutions, legal representatives and law enforcement.